Without a niche, Rubin has taken greater risks than any producer in the record industry over the past quarter century. Pushing his artists into new territory has garnered Rubin seven Grammys, including Producer of the Year in 2007, and made him the most in-demand record producer working today. Now for the first time, Rick Rubin: In the Studio offers the behind-the-scenes stories of how Rubin created hit albums with such diverse legends as the Red Hot Chili Peppers, Run DMC, Johnny Cash, the Beastie Boys, Audioslave, Tom Petty, Metallica, Danzig, Slayer, LL Cool J, The Cult, Weezer, the Dixie Chicks, Linkin Park, System of a Down, Rage Against the Machine, Jay Z, Neil Diamond, Sheryl Crow, and Slipknot. This book chronicles his meteoric rise, from his early days as DJ Double R in the early ’80s, founding and running Def Jam Records alongside Russell Simmons from an NYU dorm room, discovering and producing the Beastie Boys and LL Cool J, to his transition in the early ’90s into a successful independent record executive, signing and producing the Red Hot Chili Peppers and Johnny Cash, to his role as the most influential producer of all time (currently as the co-head of Columbia Records), and his continued successes with rock/metal supergroups Audioslave, Linkin Park, and Metallica. 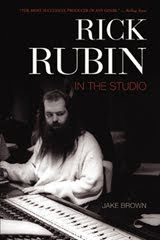 This in-depth look at the life and times of Rick Rubin — in the studio and beyond — is a must-have for any music fan.